"There's nothing small or inconsequential about our stories. It took me several weeks, but I finished reading Bittersweet by Shauna Niequist. It took months, because I wanted to savor every word. While I haven't struggled through all of the heartbreaks that Shauna suffered, much of her story felt so much like mine. I couldn't close the book a final time and just put it away. I know that I will return to this book again, when I go through a "difficult season," as she labels it, and I will find solace. I find power when reading a story that reflects my own, and that is one reason I write. I know that other people - around me and in the world, in general - experience what I do and need to know that they are not alone. Because I am, at heart, an introvert who forced herself into the world of extroverts because life in my shell was lonely and exhausting, I often find myself in a room with new people. I need to bust down walls, break my barriers, and keep building my tribe. But, because I am also a mom, I find myself with a serious case of #mombrain most of the time. I start and stop sentences without really finishing my story (oh, how much I love writing, where I can draft, revise, delete and start all over...). As the frequent new person in the room, I also find myself trying to tell a story no one listens to. I get to the middle of the sentence, and the conversation has moved on. To be fair, I'm often conversing with other sufferers of #mombrain. They can't keep their own thoughts in their heads, let alone pay attention to mine. I can't always get my spoken story out in a way that makes sense. 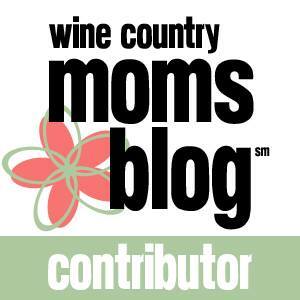 My writing led to Sonoma County Moms Blog, and I have found a new way to grow as a writer. I have written (as yet unpublished) fiction. I have drafted proposals for magazines. I have a few articles kicking around the Internet, but I realized when I first started this blog three years ago, that I don't actually want to write for a living. In my limited spare time, I want to write because I love to write. The first rule of writing: Write what you know. Fiction didn't get me there - it all felt too contrived. Plus, true story, I hate to plan it all out ahead of time, which can lead to some pretty horrible fiction. Education and finance articles made me some hobby income, but writing like that did not nourish my soul. So, I write about #momlife. I write about what it means to live in my shoes, processing the world with my particular brand of crazy. When I write, I process what life has thrown at me. 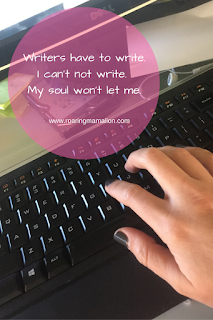 When I edit (groan), I get stronger as a writer. I never want to stop learning how to do this better. "You're such a good writer," doesn't mean much if I never grow. I keep pecking away at the keyboard, pausing to delete, rephrase, revise. While I may never see my name on the spine of a book on a bookstore shelf, I know that I am a writer. Writers have to write. I can't not write. My soul won't let me.